As customers, we expect to be treated fairly and receive an effective service from companies. Brands are aware of this and they know that our level of demand is growing at about the same pace as the competition. Thus, we will only go back to a brand if they provide an exceptional service and they make an effort to surprise us. Hence, the great importance of the concept “customer experience” over the last years, referring to the consumer experience or shopping experience. The way we buy now has nothing to do with the way we did 10 years ago. In fact, the purchase experience might be broken down into three phases; first the search of information, secondly the economic transaction and thirdly the delivery of the product or service. These three phases can be combined in different ways and performed in different media. Today, our process of purchase always includes the search of information about the product or service online. Before the purchase we check comments and ratings of other users who already have consumed what we want to buy. This search of information is often complemented going through the physical points of sale only to consult doubts with the sellers or closing the two remaining phases in this precise moment. Therefore, the economic transaction and the delivery of the product or service can go together or separately. We can pay through the network and collect the item from a physical point of sale or we can pay through the network and have it delivered at home. We can also pay and collect it at a physical point of sale and many other combinations that can be given. Summarizing, the models are completely opened and we cannot say that the Internet is definitively killing the sale and delivery at a physical point or vice versa. The most veterans will probably remember the famous “Video killed the radio star” that the Buggles were singing in 1979, but today there is no video any more and the radio is more alive than ever before. The rise of e-commerce has long worried the retail sector. Many wrongly predicted the end of the physical store, like the Buggles did with the radio. However, consumers have eventually decided that, although they still prefer the physical store as the main sales channel, the digital support has contributed to fully satisfy their wishes. Consumers’ demands automatically increased and the retail sector had to adapt to their new customer profile. In face of the inevitable ‘renew or die’, the safest bet is to expand the digital space to the world of the physical sale. This new scenario has pushed retail companies to adapt to new consumer demands and uses technology as a powerful tool to adapt their communication and the ways in which they interact with customers, to improve customer experience and provide added value to every purchase. 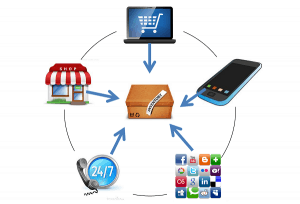 When we talk about omnichanneling, we are actually referring to the evolution of the multichannel. It is no longer enough to be present in the consumer channels (not just digital, but physical). It is essential to effectively manage these channels so as to create a flexible and satisfactory shopping experience, adapted to their consumption habits and where the use of technology is also present. For example, if a customer visits the physical store to buy a product he has researched on the website, he needs to find a coherent response. Developing and implementing an effective omnichanneling strategy is not easy. Coordination of the different areas of the company is key to maintaining the consistency required. Each channel needs its own kind of communication. Dealing with the customer via e-mail is different from communicating through social networks or over the phone. Nevertheless, it is indispensable to define a strategy that allows that the messages and actions carried out result in the accomplishment of a coherent global communication. We cannot act differently when communicating on twitter, on the phone or answering emails. Customers will probably interact with us through many media and they cannot detect that we are incoherent. If we think we can provide the service in different ways, often through subcontractors, it is especially important that we monitor and make sure that everyone contributes to generating the same shopping experience, whatever it is that we have defined in our strategy. We need to coordinate properly the internal and external resources to have everyone aligned. I dare say that beyond communicating consistently from all channels, which is obviously essential, the secret lies in listening to customers and consumers, not only to offer them a full range of solutions, but also to guide them to where they need. We need to guarantee a purchase experience that is coherent with the strategy we have defined. If we can accomplish this goal, we will be successful, otherwise we will disappear. These are the rules of an exciting sector and that moves at great speed, so we’d better wise up!